Manchester indie band James, best known for their anthemic single Sit Down, are to reform after a five-year hiatus. The group, who scored a string of top 40 hits in the 1990s, will play five arena concerts in the UK this April. According to their website, the band have also written their first new material since 2001's Pleased to Meet You album. James' Best Of collection, released in 1998, went to number one and stayed in the charts for more than a year. 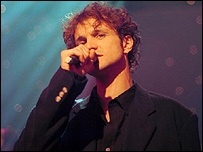 The band formed in 1982 when 16-year-old bass player Jim Glennie found singer Tim Booth dancing wildly at a student disco. They struggled for several years, even releasing the sardonically-titled live album One Man Clapping in 1989. But they achieved mainstream success as part of the early-1990s indie movement that also produced The Stone Roses and The Inspiral Carpets. After nine studio albums, the band split in 2001 amid falling sales and reports of acrimony between Booth and Glennie. Booth pursued a solo career and also appeared as Judas in the BBC's Manchester Passion last year. The reformed band will have the same six-piece line-up that featured on the top 10 albums Laid and Seven.